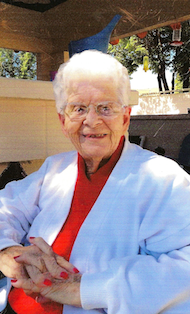 Lucille P Hampton Floryancic passed away on Saturday, October 31, 2015 at St. Mary’s Hospital, Grand Junction. She was born on July 29, 1923 in Deep River, Iowa, to Ray Phillips and Laura Vail Phillips. Her parents moved to Palisade, Colorado, when she was two years old and raised peaches in the Mt. Lincoln area. She grew up and attended grade school there, graduating from Grand Junction High School, and living most of her life in Palisade. Lucille married Carl W. (Mutt) Hampton in June of 1946. From this union, two daughters were born, Marie Granat and Marjorie Beougher. She and her husband were very involved in the fruit industry for many years in the Vineland area until her husband’s death in 1984. She married William (Bill) Floryancic in December of 1992. Lucille worked at the Abstract office in Grand Junction and also at the Motor Vehicle Department. She was a beautiful seamstress, enjoyed doing crafts, crocheting, cross stitching and being a wonderful Mom and Grandmother. She is survived by her husband, William (Bill) Floryancic of Palisade; sister Louise Oliver of Grand Junction; daughters Marie (Roger) Granat and Margie (Jim) Beougher of Palisade; step-daughter Karen (Russell) Bell, granddaughters Karie (Darnell) Bradshaw, Shawnie (Jay) Laughlin and Jamie (Ernie) Caldwell, step-grandson Kurt (Cindy) Bunte, five great-grandsons, one great-granddaughter, one step-great-grandson and many nieces and nephews. Great-grandson Braden Caldwell preceded her in death. Services will be held on Friday, November 6 at 2 p.m. at the Palisade Funeral Home Chapel. The family would like to thank the staff at La Villa Grande Care Center for the excellent care she was given during her fight with Alzheimer’s. They would also like to thank the Emergency staff, the doctors and staff on the cardiac floor for caring for her. In lieu of flowers, donations may be made to the Palisade Fire Department, Palisade Lions Club, or the Friends of the Palisade Library.